Update (2019-02-26): Apsaras, Pyro Jack, Raja Naga, Sparna, Lilim sections added and updated. Localization of media makes the whole world more cultured. But it’s a painstaking process, to say the least: Transforming the intent from one language into something natural in another takes knowledge, skill, and time, to name a few. For video games, localization’s most common thread is translation from Japanese to English, two entirely disparate languages where the process of successful conversion resembles an art form… except, in rare cases, when it can be considered a science. 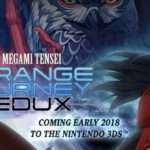 Shin Megami Tensei is an unusual series in that a not-insignificant amount of its content consists of real-world mythical characters and religious terminology—not the invented, proprietary nomenclature seen so often in other games—so in those applicable cases, it’s entirely possible to grab a textbook or encyclopedia and point to the correct translation. 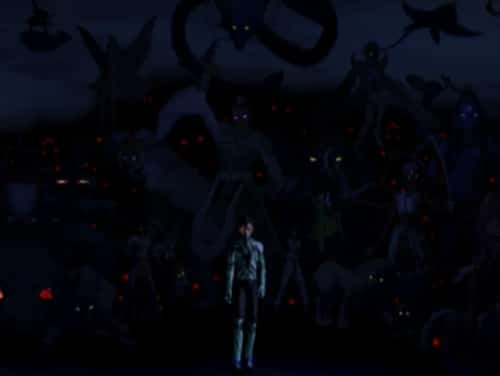 The series’ first English localized title, Shin Megami Tensei: Nocturne, established many precedents and labels still used to this day, but were all of them accurate? How many demons or names missed the mark? And which are so impressive they deserve a closer look? True Tales from Localization Hell via USgamer. Book Extract: The Game Localization Handbook: Localization Production Pitfalls via Gamasutra. The Exciting Ups and Painful Downs of Game Localization via Legends of Localization. An unshakeable fact is that Japanese allows for more phonetic information per character than English does. As a result, the space allotted for English characters, usually identical to that allotted in the Japanese version, will be effectively truncated. For example, a word that could be expressed in four Japanese characters may need at least eight in English. Since simply programming more space in the English version is usually out of the question (because of a lack of resources or because it could interfere with the code without comprehensive bug-checking), the one ace card the localizers have up their sleeves is variable-width fonts. 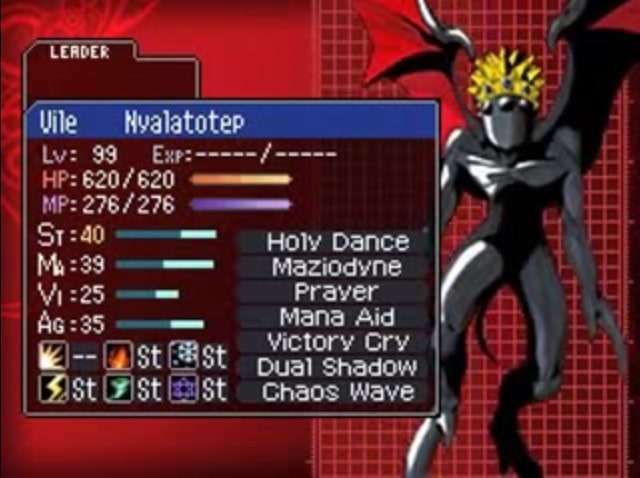 “Nyalatotep, the Craling Kaos”; the original DS version of Devil Survivor had even stricter character limits than Nocturne. As Japanese characters are fixed-width, meaning each character takes up the same amount of space, variable-width characters work around these given restraints by assigning appropriate width values to our Latin alphabet, where, predictably, beefy letters like “W” take up more room and thin letters like “I” take up less room. If you’ve typed on any Latin alphabet word processor or website entry field in the last couple decades or more, you’ve seen this in action. On average, this benefits the localizer but may not be available in all situations. Usually not a big deal but, since Japanese has three different writing systems, sometimes you will find two or more associated words that are spelled and pronounced differently in Japanese (say, one in kanji and one in katakana) that translate identically in English. Since English hates redundancy but loves synonyms, deft use of a thesaurus is usually required to alleviate any potential problems caused by this issue. 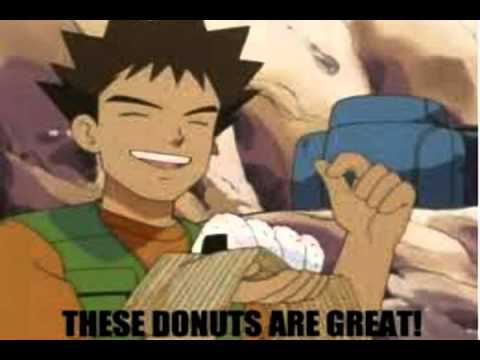 If it looks like onigiri, feels like onigiri, and tastes like onigiri, it’s a donut. A work written primarily for a native audience will often feature customs, cuisine, or objects intuitively understood by that population that would otherwise be alien to anyone else, possibly leaving that non-native audience befuddled. Possible solutions to this problem include tacking on an explanation for the sake of foreign players (which will break the immersion; for example, why would one Japanese character need to explain to another how their New Year’s works? ), amending the term in question to a similar concept in the intended region’s culture (ex: “mikan” to just “orange”), or either directly translating or transliterating the material and hoping your target audience is into that. These cultural assumptions are why sometimes a rice ball needs to be a donut. Without context, such changes are essential to maintaining a natural flow in the target language. This is also why sometimes Japan needs to be Los Angeles. If a work contains characters whose names are dependent on wordplay, the puns will need to be localized to the target region to work–possibly necessitating that the setting change as well, despite any egregious (or hilarious) idiosyncrasies. Who among us isn’t at the mercy of time? Most well-oiled localization teams allot themselves enough time to translate the most crucial features of a game’s text, usually the main script and gameplay prompts, though the exact timeframes arranged may vary from project to project and company to company. 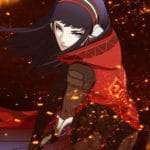 But from my own personal peeks into how Atlus USA works, Shin Megami Tensei games in particular love to irrupt the workflow with completely obscure demons or words that simply can’t be afforded the individual attention necessary because one demon name is pretty low on the totem pole compared to other, more gameplay-vital text. You would think the localizers would have the original Japanese development team or writers available on speed dial for these frustrating situations, but apparently this isn’t the case. The only hope is the possibility of extra time at the end of a project after everything else has been proofed and edited—never a guarantee. Before the look at Nocturne begins in earnest, I need to make few special mentions. The first is that Nocturne‘s localization owes a beer to Persona 2: Eternal Punishment‘s, which was the first acceptable English localization of any Megami Tensei game. It’s rough in spots and I can’t entirely say Nocturne‘s builds off of it, but certainly a few names, skills, etc. (ones that, honestly, won’t be discussed here) first appeared translated in EP. Cheers! Secondly, an aspect of Nocturne‘s localization that will be exempt from this discussion is its script. Sure, it’s the core of the work and it may seem like a glaring omission considering the topic, but I simply don’t feel qualified critiquing it; for one, it would be beyond my meager Japanese language chops to compare and contrast such an expanse of text. Besides, the script is where the “art” side of localization matters most: Atlus USA may have utilized some creative linguistic twists and turns in their effort that don’t match 1:1 with the Japanese, but the final English Nocturne script is fluid and coherent, and what more do you want? I’m much more interested in the “science” of demon terminology, as errors made here have persisted to subsequent games. And finally, a special thanks to Nocturne‘s localization team. This includes but may not be limited to Yu Namba, James Kuroki, Bill Alexander, and Aron Brent Gutierrez. 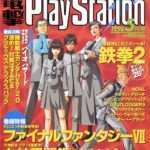 Without their offerings of blood, sweat, and tears 12 years ago, not only would this article not exist, but Shin Megami Tensei may have never gotten off the ground in North America. Much respect! So if I’m going to talk localization science, that’s where I should start. Naturally, that means demons! Depending on the demon, finding its true romanized name can be either as easy as a quick Google search or a challenge akin to finding your way out of the middle of a cornfield blindfolded. 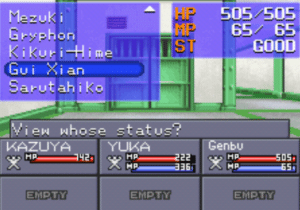 I have a certain amount of experience with the latter: One of my pastimes many years ago now was organizing and translating SMT games’ demon rosters on Giant Bomb (a game website with a wiki). At the time, many of the demons from obscure rosters, or even obscure demons from mainline rosters, remained mysterious and untranslated. I was able to track down a number of them, but there seemed to be as many others that proved elusive or whom I completely misidentified. Some entries may fall into multiple categories. Except for groupings, the demons are listed below in the order they appear in Nocturne‘s compendium and the official strategy guide. MITHRA: (E) Mm-hmm, this article series couldn’t have started off with a bigger headache, I don’t think. 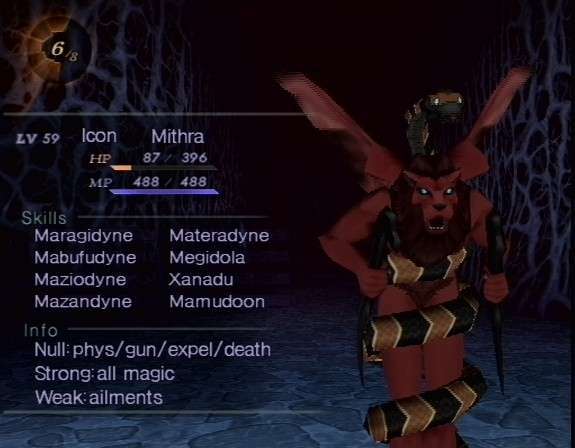 Speaking of works from my Giant Bomb past, I once devoted an entire page discussing the tangled web of names created by both localizations and inconsistencies in the Japanese versions for this cursed leontocephaline demon; check it out for the full scoop. 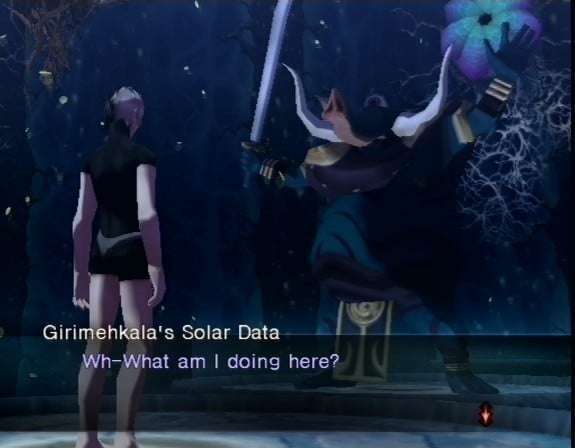 But the short version, based on this Nocturne appearance and the Japanese spelling of his name, is that this demon is meant to be the Vedic deity Mitra, not the Zoroastrian Mithra or the Roman Mithras. I’m glad this article’s scope is limited to Nocturne, else I might burst a vein talking about subsequent Japanese releases renaming Mitra to Mithra and the shuffles in Strange Journey‘s localization. BEIJI WENG: (CLV, E) This demon’s name in Japanese, Hokuto Seikun (ホクトセイクン), matches with the kanji 北斗星君, which are read in Chinese and subsequently funneled through pinyin as “Beidou Xingjun“; that probably wouldn’t have fit within the limits. So what’s a “Beiji Weng”? It seems to be a (possibly related) thing, but, as with most Chinese demons, it’s best not to ask, for fear of over-inflating your blood pressure. UZUME, KUSHINADA, MIKAZUCHI, MINAKATA: (CLV) Ame no Uzume, Kushinada-hime, Take-Mikazuchi, and Take-Minakata all had extra titles or appellations that caused their character totals to tip the scales; their names would be fully restored in future releases. Just trying to be thorough here! BISHAMON, KOUMOKU, ZOUCHOU, JIKOKU: (CLV, LH) The Four Heavenly Kings of Buddhism present an interesting localization challenge (that has nothing to do with the minor, temporary loss of each’s “-ten” suffix): When a demon originates from a religion or pantheon that spans multiple countries and languages, which name is the most appropriate? For the Heavenly Kings’ Bishamonten, these choices range from his said Japanese name, the Chinese Píshāmén Tiān, or Sanskrit Vaiśravaṇa. All would be technically correct. Fortunately, designer Kazuma Kaneko provided an easy answer in this case: The depictions of the Kings are heavily skewed towards Japanese iconography, as the four are probably more popular in Japan than anywhere else in the world; they also frequently appear in the series specifically as protectors of Tokyo. It just wouldn’t make sense to call Bishamonten by the name Vaiśravaṇa when he looks like he belongs inside of a Kyoto temple. Art design can play a role in localization. Considering that most Buddhist demons in the series are called by their Japanese names in the Japanese versions (but not all, like Atavaka! ), these issues appear frequently. 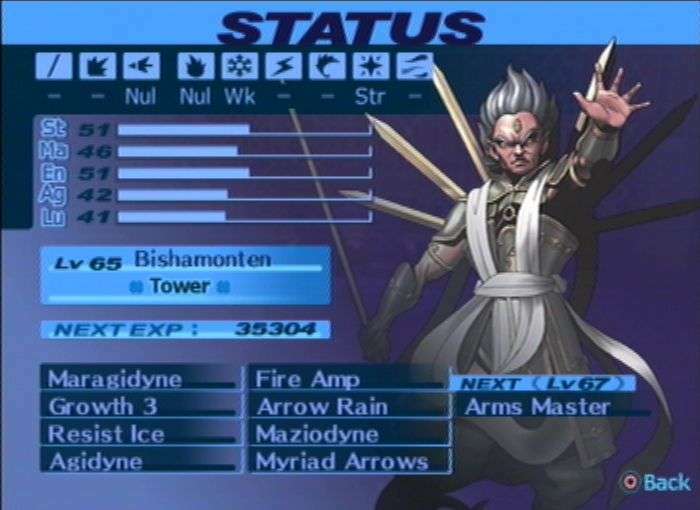 For example, the localization of Shin Megami Tensei IV: Apocalypse rendered the Buddhist demon Miroku’s name as the Sanskrit “Maitreya.” While again technically correct of course, the in-game appearance of the demon is entirely lifted from Chinese and Japanese imagery. One screenshot, two different, inappropriate names for China’s Black Tortoise. 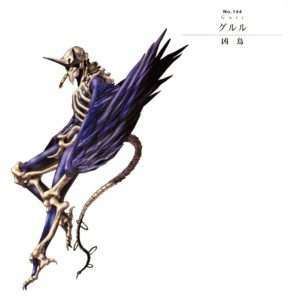 Of the discrete mythological groups that appear in Nocturne, the beasts of the Chinese Four Symbols may have fared the worst with regards to proper translation. Only one features an entirely correct name, while two others have been completely misidentified—errors that persist to this day. BAIHU: (LH) The sole correctly translated beast, Baihu the White Tiger has been living the good life since 2004. 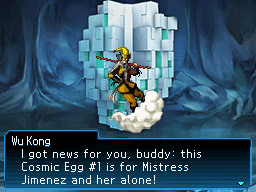 FENG HUANG: (E) Like Mithra, I’m glad I only need to focus on the Nocturne appearance for this demon (and name). Straight up: “Feng Huang” this demon ain’t. The actual Feng Huang HAS appeared in other SMT games, but the name we want for this feathered friend, the Vermilion Bird, is Zhuque. LONG: (CLV?) “Long” is technically correct, it’s just not entirely correct. The full name of this beast, the Azure Dragon, is Qinglong. Now I don’t claim to know much Chinese, but I do know “long” means “dragon,” so “qing” must mean “azure.” So a Long without a Qing is just a long, if you catch my drift. GUI XIAN: (E) So while the name we’re seeking for the Black Tortoise is Xuanwu, “Gui Xian” is nonetheless within the ballpark, albeit a foul ball hit into the first base side stands: One of Xuanwu’s alternate names is “Xuangui,” which is just a minor mix-up away from explaining how this demon got its localized name. But if we already know the names, then what’s the big deal? The issue is a question not of where the folklore says Senri originates, but rather where the folklore itself originates. For one, sources about the Senri tend to be Japanese, not Chinese. That they attribute a Chinese origin doesn’t necessarily mean definitively that there is a parallel being in China; such is the ethereal nature of folklore. So, as a potentially Japanese creation, “Senri” remains the only logical choice to make for this demon until a magical confirmation of “Xianli” springs forth from deep beneath the Chinese anthropological soil. FLAEMIS, AQUANS, AEROS, ERTHYS: (G) As far as I’ve been able to tell, Flaemis, Aquans, Aeros, and Erthys don’t actually “exist” in any text; they are merely the personified elements of Fire, Water, Air, and Earth. As series originals, Atlus USA then had free rein to improvise the names. While Aquans and Aeros are obvious enough, some old Japanese books render the remaining pair as “Flamies” and “Earthies.” I think we dodged a couple of bullets there. PURSKI: (E) Ah, “Purski.” I can see Atlus USA’s editors in 2004 just throwing their hands up at the deadline for this one. Can’t blame them, either—this demon is more than just obscure, it is practically nonexistent. So if it’s hard enough to track down on the Internet in 2016, can you imagine how it must have been twelve years ago, when encyclopedic sites we take for granted, like Wikipedia, were only in their infancy? God forbid, they probably needed to use books as primary sources! And one particular book is likely where they pulled the name “Purski”: Kazuma Kaneko’s Pandemonium Volume 2, to be exact. Each demon entry in the Pandemonium book features a romanized name in addition to its Japanese one, sometimes with astounding inaccuracy—and so it was for “Purski.” This probably happened because his original Japanese name is プルシキ (purushiki). Contract the phonemes, and you’ll get something like “Purski.” Compounding the confusion, “プルシキ” is the demon’s name in certain older games ONLY. By the time of Devil Summoner, it would be written “プルキシ” (purukishi), switching the シ and キ around; books like Pandemonium do confirm, however, that these all refer to the same demon. By trusting that the latest spelling was more accurate and assuming there would be truth found in its transliteration, searching eventually led me to this demon’s actual romanized name: Pulukishi. It seems so obvious in hindsight! But when there’s such a steep, rocky road to traverse even in the original Japanese source, you can’t really blame anyone for turning back before they begin to doubt themselves, the authenticity of others, and the purpose of life in the universe. 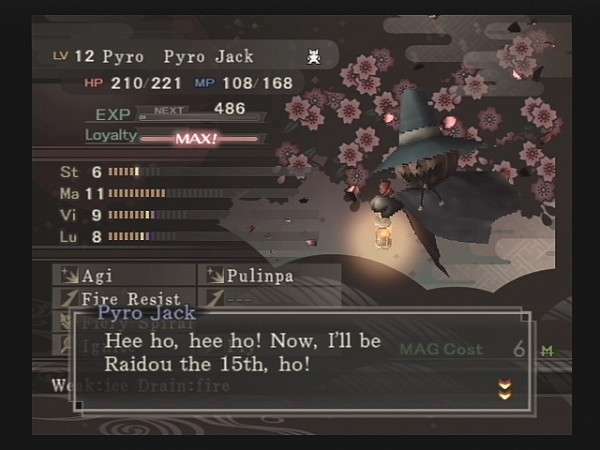 PYRO JACK (CLV): Perhaps the most famous character limit victim of them all. “Jack O’Lantern” was never going to fit and still might not fit within the more generous character limits of recent games. Where “Pyro” came from I have no clue, but at least it’s something of a creative compromise, as unfortunate and out of the hands of the localizers as it may be. 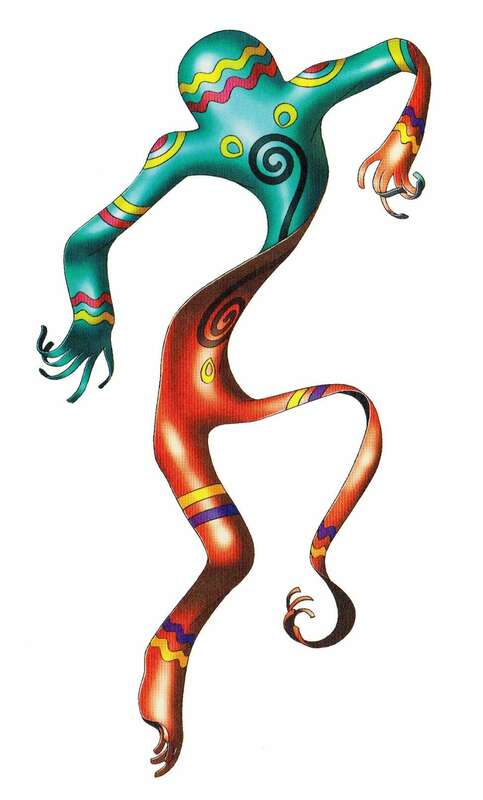 But there may have been another option after all: “Stingy Jack” is an alternate name given for this bedeviled soul in related folklore, one that would surely play by any SMT game’s character limit rules. I have to admit that this is endearing in spite of its absurdity. UPDATE: Those crazy clowns at Atlus USA, they did it, they really did it: Pyro was finally renamed to Jack-o’-Lantern in Persona 5! Unfortunately, he was back to Pyro as of Strange Journey Redux, proving that bigger budgets can also lead to bigger character limits. It’s a safe bet, then, we’ll see “Jack-o’-Lantern” proper make a return in Shin Megami Tensei V.
RAJA NAGA: (E) Should be Naga Raja (or Nagaraja). To explain why, I could either expound laboriously on the grammar of Sanskrit-derived honorifics or simply leave you with these Google searches for “Nagaraja” and “Rajanaga” to show how the former gives results from Indian cultures and the other just brings up SMT stuff. Considering the Japanese name is “ナーガラジャ” (“naagaraja”) it’s surprising that the two words were switched in the first place. CERBERUS: (G) Rarely you will see cries that Cerberus’ name should have been localized as “Kerberos,” the original Greek rendering of the name, instead of the Latin form used, since the Greek is also what’s reflected in the beast’s Japanese name, ケルベロス (keruberosu). However, such complaints fail to realize that the Latin version has simply become the default spelling in English for the venerable Hades hound. GIRIMEHKALA: (E, LH) It took me years of off-and-on searching to find specific scholastic mention of the Sri Lankan name of Mara’s foul pachyderm. It’s a topic to which I devoted a blog post, but the gist is that “Girimehkala” is actually spelled “Girimekhala”—only the “k” and “h” needed switching. I was frankly amazed: How did Atlus USA get so close to the mark to a name only attested in Sri Lankan Buddhism, with scarce sources to boot? (No credit to Pandemonium–it’s misspelled there.) A minor error in no way sullies what is otherwise a highlight. While the “Girimehkala” typo persisted in the series for years, it has been corrected as of Shin Megami Tensei IV. Girimekhala will always be “meh” to me. ACIEL: (E) This demon’s actual name was only found recently. 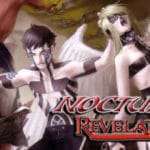 In Nocturne he’s “Aciel,” but in other games like Strange Journey he’s called “Alciel.” Turns out the real deal is “Arsiel,” which you can read more about here. QUEEN MAB: (G) The name “Queen Mab” is absolutely correct, totally on-point, etc. However, go digging through her diary and you’ll likely come away from it perplexed as to her actual identity. But worry not, thanks to help from SMT translation hero Dijeh, I was able to write a primer on who exactly Queen Mab is supposed to represent. KAIWAN: (LH) Kaiwan is another great localization choice. 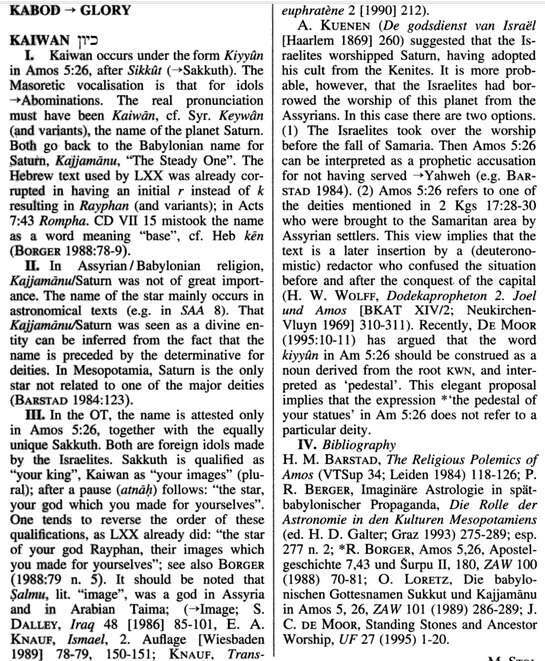 An Old Testament heresy in the form of a deification of the planet Saturn, mention of Kaiwan can be found in Amos 5:26, where he is often called Kiyyun. Kiyyun is the name in the Japanese version (キウン, kiun), but, as proved in the seminal scholastic work the Dictionary of Deities and Demons in the Bible, “Kaiwan” may indeed have been closer to the actual pronunciation and that spelling is seemingly preferred by scholars. Kaiwan’s entry in the Dictionary of Deities and Demons in the Bible. LILIM: (?????) Lilim deserves her own assessment category for nearly driving me to drink. Like Apsaras and Marut before her, the problem here is that the Hebrew name “Lilim” carries one of the language’s plural suffixes, -im (or yod-mem), yet SMT (and Nocturne) usually deal with demon units individually. So, if actual usage of “Lilim” specifies a group (and most references to them imply as such), a sole Lilith spawn should probably not be called by a plural name. Then what would be the correct name for one of them? That’s what’s so difficult to determine. It seems like it might be “Lili,” a name casually confirmed on dubious occult reference sites and on Wikipedia without a citation; as much as I want to believe that’s the real answer, it aggravatingly lacks a reputable source. 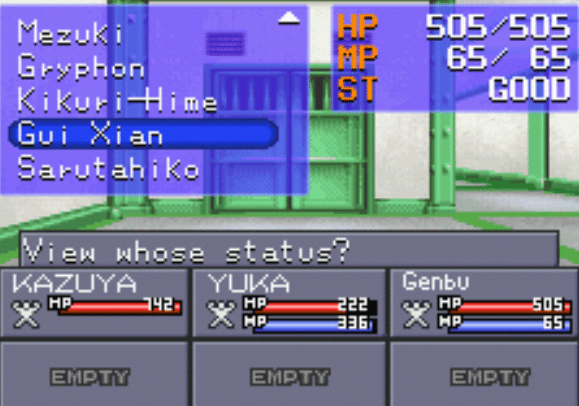 Thankfully, the other demons with Hebrew names have no similar localization issues; Ophan goes by the plural in Japanese only, while Cherub is single in both languages, probably due to its adoption from Christian and not Jewish sources. But for Lilim’s localization status, sadly, I have to concede that it’s only based on a hunch… for now. If anyone out there, including Hebrew speakers, has a definitive answer for this, let me know! Her name in Japanese, リリム (ririmu), also includes the Hebrew plural. RAKSHASA: (E) Straightforward error here: This demon is simply a Vetala, and was corrected to such in subsequent localizations. Baffling, but NBD. CHATTERSKULL: (CLV) “Laughing Skull” contained just a little too much mirth to fit. PRETA: (G?/E?) I didn’t expect the lowly Preta to be one of the most difficult demons to evaluate, but here we are. I had assumed it would just be an inverse of the situation presented by Bishamonten and his pals: When is a Japanese Buddhist word properly localized with a Sanskrit name? This entry itself was meant to be the answer: Sanskrit “Preta” as a localization highlight, end of story. 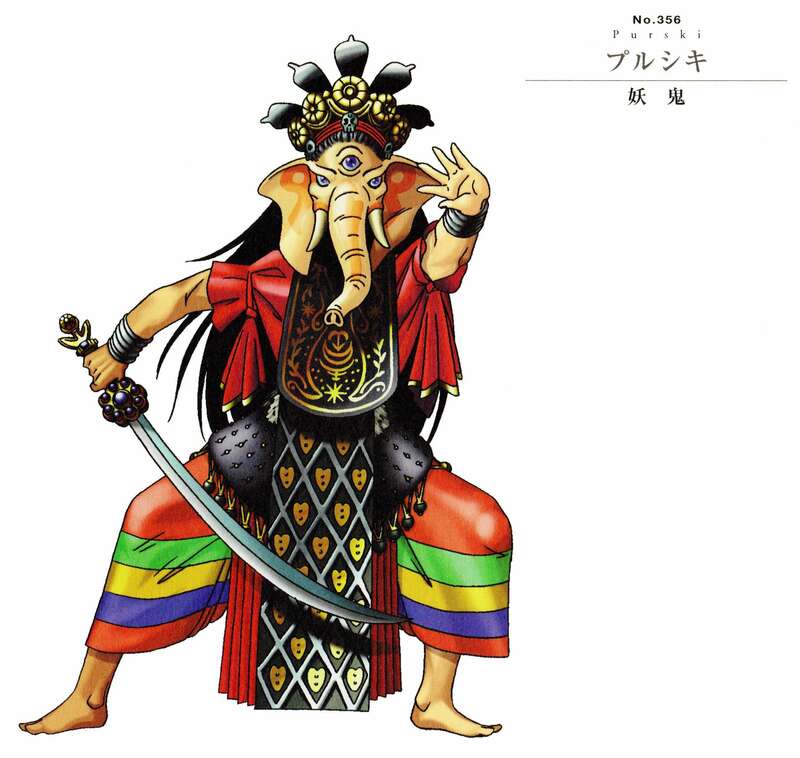 But now I’m not so sure, the reason being the same logic that led me to declare the Four Heavenly Kings’ names as definitive: Shin Megami Tensei‘s Preta designs look decidedly Japanese. 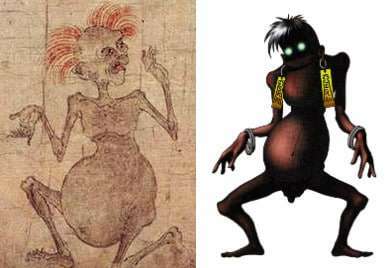 There are numerous depictions of Preta in the Indian subcontinent and beyond, but only in countries influenced by Chinese writing are they called, literally, “hungry ghosts“; traditional art of them as famished ghouls with distended bellies, like Kaneko’s, seems to exclusively originate from Japan (I tried but could not find any exclusively Chinese Preta artwork). So if I’m to be consistent, I gotta say that the series’ Preta should probably be called Gaki after all. On the other hand, Preta are not individual characters like the Four Kings but are a class of beings, so calling them by their most generic name available in English sources isn’t entirely inappropriate. I’m totally comfortable calling this one a wash! A traditional Gaki (left); SMT’s Preta (right). GURR: (E) The unfortunate “Gurr” is another long-running demon name error. This Sri Lankan bird’s real name is Gurulu, and is easiest to find in a mask form called Gurulu Raksha. I can’t imagine there being any other explanation for this error other than a complete lack of information during the localization process. But, like Pulukishi’s “Purski,” I do know where “Gurr” comes from: ” Gurulu’s name is printed as “Gurr” in Kaneko’s Pandemonium Volume 1. Surely the Atlus USA staff had a complete set of the Pandemonium books and deferred to them whenever something proved insurmountably recondite. Gurr, you rock my world. THE HARLOT: (CLV) Poor Mother Harlot‘s name was too long to fit in the demon name slot; however, it is spelled in full during her battle dialogue. Of course, this is no longer an issue. DAISOUJOU: (LH) They could have literally translated the name as “High Priest,” but they didn’t. And I couldn’t be happier: “Daisoujou” is just too much fun to say! Imagine if he shrieked his name like a Pokemon every time he used one of his broken skills—he’d probably be even more beloved! MANIKIN: (LH) The Japanese version calls these seizure-afflicted souls “Manekata” (マネカタ), which is a portmanteau of the words 真似 (mane; “imitating/copying”) and 形代 (katashiro; a material representation of a sacred object or paper doll used in Shinto purification rites) according to the Demons Bible, a supplementary book for Nocturne released in Japan. While we lose the religious connotations in translation, adapting the word “mannequin” into a new form still implies there’s something off-kilter, yet unmistakably human, about the Manikins; they are, after all, the closest Nocturne comes to hoi polloi. I appreciate you joining me in exercising Nocturne‘s demons! Of course, this isn’t even the half of it! 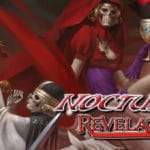 Next time on Nocturnal Revelations, I’ll present an exhaustive look at the exalted highs and unfortunate lows of the game’s demon races! You can find the continuation to this series, Part 2 and Part 3, here.